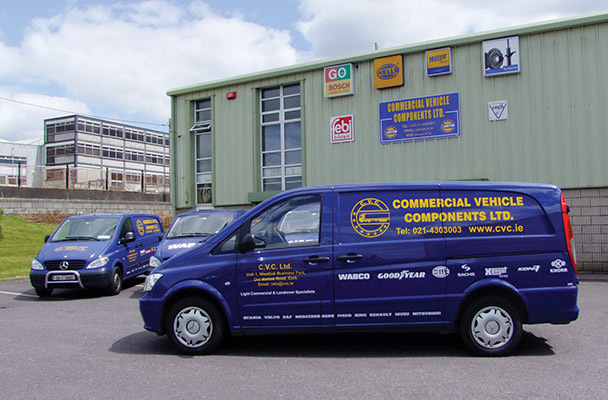 Commercial Vehicle Components Ltd or C.V.C. as they are generally known to the transport industry is located on the outskirts of Cork City on the Old Mallow Road. We profile this leading supplier of truck parts, bus parts, light commercial parts and specialists in Land Rover parts. Managing Director Sean McElhinney took time out of his busy schedule to talk to us about the business. Since C.V.C.’s inception in 1990, as a sole tradership, the business was started by myself and my wife Lynda. It grew steadily and in 1992 C.V.C. registered as a limited company. Our first depot was located at Cronins Coaches premises on the Old Mallow Road. In 1999 we built our own warehouse facility at the Westlink Business Park and we presently occupy 16,000 sq ft of warehousing. In January 2014 C.V.C. opened a depot at Greenogue Business Park in Rathcoole in Dublin and Fran Kerin who is well known in the transport industry with 30 years’ experience runs this facility,” said Sean. C.V.C. employs seventeen staff, all with vast experience in the transport industry. C.V.C. is very much a family run business and it prides itself on attention to detail, customer service and a prompt nationwide delivery service. C.V.C. stock over 75,000 parts in its warehouse and their suppliers will ship direct to their customers overnight from Germany and U.K. on an express service, if required. In January 2014, C.V.C. launched its own independent ‘on-line’ service www.cvc.ie where customers can view the various products available to the transport sector. They verify all parts using chassis number or registration number to ensure correct parts are supplied to the customer. “The telesales response is manned by John Howard, Tim Curtin, Evan Johnston, Conor O’Mahony and myself . The sales reps are Bernard Humphreys, Jonathan Huggard and P.J. Coughlan. "The warehouse manager in Liam O’Donoghue. Cathy Robinson, who has been with the company since 1993, manages stock control, supplier invoices and general administration. Lynda is the company credit controller and Aoibhne is our receptionist and deals with online sales and general administration. Conor O’Mahony places all our stock orders with our suppliers on a daily basis and is our ‘in house’ I.T. manager. “We have customers in every county in Ireland. We have found from experience that the best form of advertising is customer satisfaction and word of mouth. Repeat business grows from customer satisfaction and I’m confident that if we continue to meet the challenges and demands within our specialised field the business will continue to grow and flourish and we look forward to the next 25 years with confidence,” concluded Sean.